Durango Youth Lacrosse, in black jerseys, plays against Vail Valley in Grand Junction. 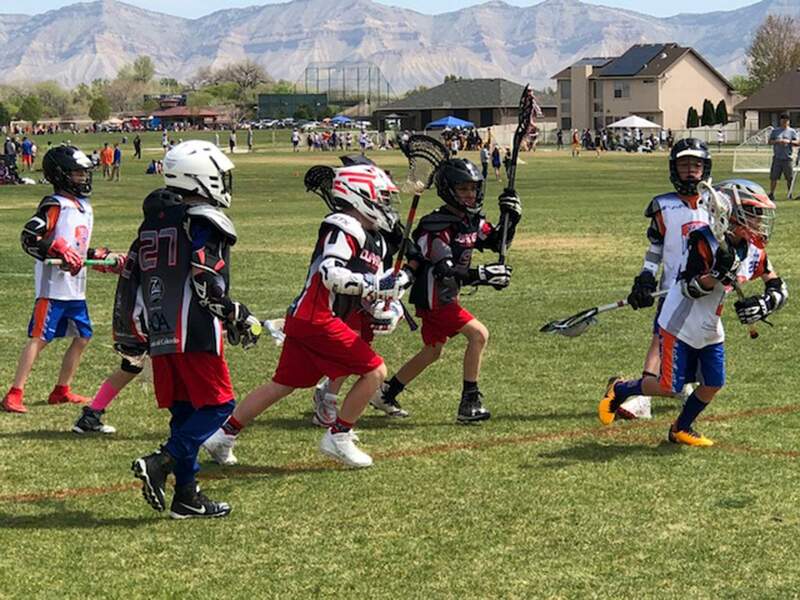 Youth lacrosse is gaining in popularity across the country, including in Durango, where a regional tournament is being held this weekend. Pictured: Wesley Campano, No. 27, son of Sara and Ralph Campano; Hayden Hollister, center, son of Joan and Stuart Hollister; and Sawyer Jones, No. 9, son of Jessika Buell and Sam Jones. Lacrosse is one of the fastest-growing sports in the United States, and Durango has a burgeoning youth program that aims to teach kids skills on and off the field. Nationally, youth lacrosse participation has more than doubled from 220,797 players in 2006 to 454,527 players in 2016, according to US Lacrosse, the governing body. Durango Youth Lacrosse has about 85 players this season, including 26 girls. The program serves an age range of 8 to 15. “It’s not just a sport, it’s teaching life skills, it’s teaching ways for young adults to grow up and succeed in life,” said Howard Mulcahey, coach and president of Durango Youth Lacrosse. In a sign of how significant the sport has become, a youth tournament will be held this weekend in Durango. The tournament will bring 36 teams from throughout the region. Each team usually has 15 players, so there should be more than 500 players in town along with parents, coaches and other spectators. They will play at Smith Sports Complex at Fort Lewis College. Durango’s main rivals are from Albuquerque, Grand Junction and Telluride, Mulcahey said. Kalisha Crossland, a board member of Durango Youth Lacrosse, said playing lacrosse presents a learning opportunity to develop life skills such as teamwork, commitment and following directions. She has a daughter and twin sons who play. The organization’s guiding principles say it promotes family, school, community, team and self – in that order. “I’ve seen hundreds of kids do well and do poorly based on how well they follow these principles,” Mulcahey said. Durango Youth Lacrosse girls head coach Kevin Wold said the sport has a welcoming community and builds integrity and character. “It’s just something where you get these kids involved and they’re part of something way bigger than just that one little sport,” he said. Lacrosse is considered the “fastest sport on two feet,” Mulcahey said. Kids are attracted to the game because it is an active sport. It is faster-paced than baseball or soccer, he said. Lacrosse is a mash up of a few different sports, Wold said. It has the running of soccer, stick handling of hockey and physical contact of football. There are differences betweens boys and girls lacrosse based on physical contact and play style, Wold said. Boys are allowed to be more aggressive and engage in physical contact, so they wear gear with plenty of padding. Girls wear only mouth guards and goggles because physical contact is not allowed. Girls also do not have sticks with deep pockets that the boys do, so cradling the stick is more important. Despite the aggressive nature of the game, head injuries are kept to a minimum because players do not tackle each other like in football, Mulcahey said. Kids can advance through the ranks of the sport in Durango and beyond. Durango High School and Fort Lewis College have programs, and there are both indoor and outdoor professional leagues in the U.S.
Wold said there are multiple ways for the program to grow, including more tournament opportunities and year-round leagues. But the program needs more places in Durango to play and practice. “Wall ball,” or tossing a lacrosse ball at a wall and catching it with the stick when it bounces back, is a great way to practice. However, the architecture of buildings around Durango does not hold up to balls being thrown at them, so Wold would like to build a wall ball court.